The Maldives are a destination that most will have on their bucket list – and rightfully so. Icing sugar hued sand, clear blue waters, five star service – as budget options are not in abundance here – and a genuine sense of hospitality from the Maldivian people: the sales pitch writes itself. In addition to that, every blogger under the sun raves about the Maldives and we get exposed to many turquoise memories in the shape of throw backs and ”take me back” posts, so much so that Instagram has become one giant advert for the tiny South Asian country. In my previous line of work (the VIP aviation one, also known as the one that took place embarrassingly many years ago but lingering around the topic would draw attention to my age), I was fortunate enough to visit the Maldives on a few occasions. 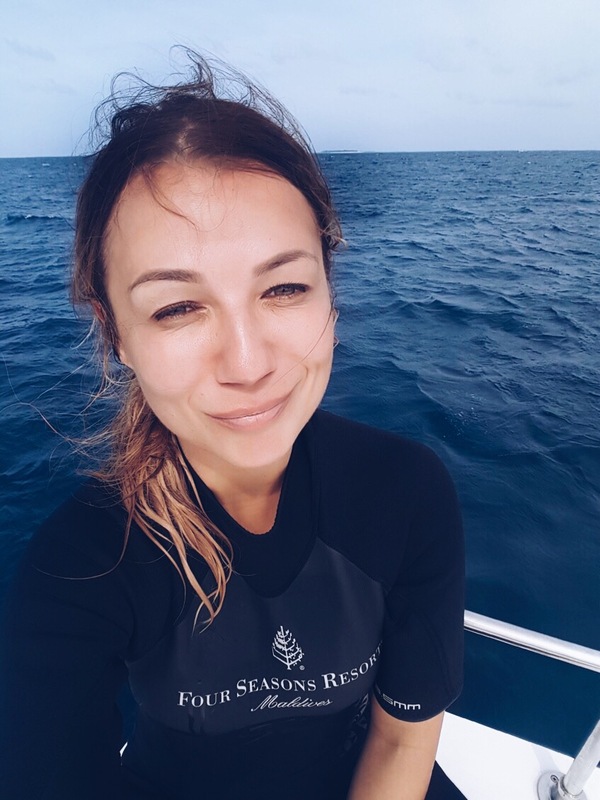 The reason why I bring this up is to say that whilst Maldives per se is a wonderful destination, the experiences differ vastly depending on what resort you choose. My VIP aviation experience will come in handy one more time whilst telling this tale – having spent a decade working with dignitaries, VIPs, VICs and royals, my job was to know everything there was to know about premium hospitality and luxury offerings. Nowadays when I visit resorts in the capacity of a blogger, I am naturally predominantly grateful to be invited and very much at ease: hello vacay disguised as work. But old dogs new tricks and so on – I find it hard to fully switch off and I find myself paying attention to every single details like back in the day when my paycheck depended on it. This is where my love for the Four Seasons group comes in. I have worked with their resorts for quite a while now and each and every time I get a chance to do so, I get reminded that when it comes to unparalleled levels of service, they are in the lead. To illustrate this statement I will give you an example – the rooms are all equipped with Nespresso machines – score. The capsules come in three flavors but I am mostly fond of Dulsao, a velvety yet punchy medium roast, so I tend to annihilate them all minutes after checking in. On the second morning of my stay at Landaa Giravaru, the room service staff had not only replenished all the coffee suuplies as per protocol but also made sure to double up on Dulsao roast – seeing as they picked up on it being my favorite flavor. Back in my days of being a hospitality instructor this is exactly the hospitality ethos that I would have tried to convey to the staff I was training. True hospitality is anticipating and executing a guests needs before they’ve even had a chance to name them. Right – I am digressing, as I so often do. The Four Seasons Maldives consists of two resorts (on two separate islands) and despite that I had been to both once prior, when it came to choosing a destination to celebrate my 40th birthday I answered on the spot. All I wanted to do was to live the barefoot luxury life one more time! Good coffee in hand and headed for a deep sea dive. Few things compare to how lyrical you feel afterwards. Landaa Giravaru – the larger and newer of the two resorts. An island so big that you must travel by bike. Breathtakingly beautiful regardless of the weather. It can only be reached by sea plane. Bungalow 121. I think it had been selected for me because of the majestic array of fronds on it’s doorstep. Kuda Huraa is the first, older of the two Maldivian Four Seasons resorts. It hosts great snorkeling spots and most importantly a surf swell. The water villas have recently been refurbished and as ”must do all the things” prone as I am, I barely left ours. It hosted everything that I could wish for and made for a perfect hideaway from reality. Bubbly baths were being had, stars were being counted and books were being read – all to the sounds of crashing waves with the odd little black tipped reef shark swimming by. Island spa at Landaa Giravaru. Each of the two resorts has three restaurants to choose from with both international and local offerings. I am no stranger to a spicy curry so I tried to eat Maldivian specialties interspaced with simple barbecued seafood and island grown passion fruit. 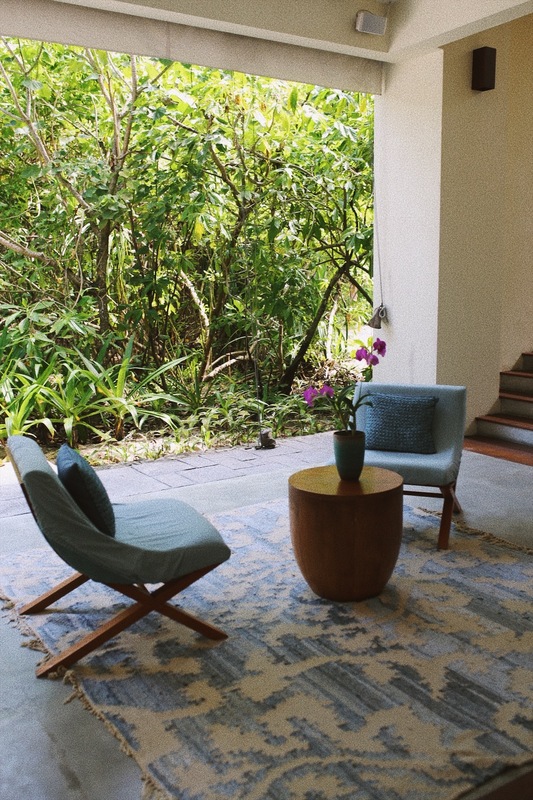 The interior design of the common areas at Landaa Giravaru was really different from the standard tropical island offering, with lighter woods, tasteful tapestry and a more contemporary feel to it. Maldivian breakfast – fish curry, light as air parathas and tuna chutney, rinsed down with a coconut latte. No request was ever denied and when I asked for a simple kale salad outside of the standard room service menu I received one within the ordinary delivery time. I would have been happy either way but I was touched at how the chef went out of his way to make it happen – it’s important to remember that apart from coconuts, seafood and a few other items all the ingredients are delivered to the islands by boat, biweekly if I understood it correctly. (The Four Seasons hotels have a global mobile phone app through which you can chat to a designated concierge member and even order your room service – somewhat like a fancy deliveroo if you so wish. But like, very fancy). Don’t forget to visit the yoga shala when at Landaa Giravaru. Swing yoga is fun even if it may leave you a little dizzy. Preferred status quo – sandy. Whilst the Four Seasons may be far from the most affordable option in the Maldives, if you are planning a trip for that one special occasion and you want it to be truly memorable I highly recommend this resort. It is abundant it activities (should you want to keep yourself entertained) but if you prefer to withdraw yourself from the world the members of staff are deserving of being called mindreader and will tend to you in an impeccable manner without imposing on your time with your loved ones. I remember meeting Richard Quest from CNN Business Traveller as one of my passengers in First Class – this again being a a decade and a half ago so bordering on ancient history. I asked him what his definition of good service was and his answer really stuck with me for all these years. He simply replied ”good service is when you know when to entertain me and spoil me with attention or know not to invade my personal space, tending to me as you weren’t there and food and drinks appearing out of thin air, like magic. Excellent service is when you know which one I prefer without me having to tell you”. Next Post Botox and fillers – Dubai.